The "Jean-Baptiste Lainé" or Mantle site in the town of Whitchurch–Stouffville, north-east of Toronto, is the largest and most complex ancestral Wendat-Huron village to be excavated in the Lower Great Lakes region to date. In 2002, a Huron village from the late Precontact Period (i.e., immediately prior to the arrival of Europeans) was discovered during the construction of the new subdivision in Whitchurch–Stouffville along Stouffville Creek, a tributary of West Duffins Creek, on a section of Lot 33, Concession 9. From circa 1500 to 1530 AD, 1500 to 2000 people inhabited the 4.2 hectare site. The community was likely created from multiple smaller sites, including the Draper Site, located five kilometres south-east of Mantle in north Pickering. In 2012, archaeologists revealed that they had discovered a forged wrought iron axehead of European origin which had been carefully buried in a long-house at the centre of the village site. It is believed that the axe originated from a Basque whaling station in the Strait of Belle Isle (Newfoundland and Labrador), and was traded into the interior of the continent a century before Europeans began to explore the Great Lakes region. "It is the earliest European piece of iron ever found in the North American interior." The Mantle site was enclosed by a three-row wooden fort-like structure (palisade) with 95 longhouses, of which at least 50 were occupied at any one time. Each longhouse was approximately 20 feet (6.1 m) wide, 20 feet (6.1 m) high; lengths varied from 40 feet (12 m) to 160 feet (49 m), with a typical length of 100 feet (30 m). They were constructed from maple or cedar saplings and covered by elm or cedar bark. The layout displays a uniquely high degree of organization (when compared, e.g., to the Draper Site), and includes an open plaza and a developed waste management system. Maize comprised 62% of the community's diet, which translates to approximately one pound of maize per person per day, or (minimally) 1,500 pounds for the community per day. More maize may have been required for trade with the Algonquin people to the north. The community farmed 80 square kilometres of land stretching up to five kilometres in every direction from the village site. For clothing approximately 7000 deer hides per year were needed, which would have required hunting about 40 kilometres in every direction from the site. A series of modeled human and animal effigies ceramic vessels were found on the site. These are similar to ones found on contemporaneous Oneida villages in New York State, indicating the cosmopolitan nature of the community that settled the Mantle site. The humanlike effigies are thought to be mythical cornhusk people associated with horticultural crops. Unlike other indigenous villages in the Great Lakes region, the Mantle site is unique "in that it represents a community that had already come together from several villages and chose to build here." During its existence, the community was the only village near the eastern Rouge trail linking Lake Ontario and Lake Simcoe and north of it. Artifacts found indicate trade and interaction with distant First Nations groups to the north, east, south and west. After two or three decades on the Mantle site, the people abandoned the location in the first half of the sixteenth century. They likely moved five kilometres north-west to the so-called Ratcliff site and / or the Aurora/Old Fort site. In the seventeenth century, the community likely joined others to form one of the Huron tribes in the Orillia-Georgian Bay area. With the discovery of the Mantle site by Lebovic Enterprises, Archaeological Services Inc. was contracted to complete an evaluation of the site's significance. A decision was made to preserve about 5% of the original Mantle site, primarily along the bank of the creek. The site was documented and over 150,000 artifacts were removed for study and interpretation at McMaster University and the University of Toronto. Because of their national significance, the artifacts will be safeguarded by the Canadian Museum of Civilization. The archaeological site-work took three years to complete (2003–2005). Most of the site is now a storm water pond; the homes on the south-west corner of Lost Pond Crescent are also on the village site. A small cemetery found outside the village walls has been preserved and protected in accordance with the provincial cemeteries act and in consultation with First Nations. The consequent development of the west side of the creek in the Fieldgate River Ridge subdivision around James Ratcliff Avenue was delayed significantly. The village ossuary, a mass grave with an expected 300 to 400 skeletal remains, has not been yet been located. The Town of Whitchurch–Stouffville is planning further housing development immediately south of the Mantle site in the town's Phase Two development plan. In 2004, First Nations peoples visited the site and performed ceremonies. The Mantle site (among others) is mentioned in the 2007 provincial inquiry into the Ipperwash Crisis; the report highlights the importance of ancestral burial sites to First Nations people, explains why they often become flashpoints for occupation (a need to protect them from further desecration), and recommends consultation with First Nations regarding the disposition of a site. Consequently in 2007, the Town Council of Whitchurch–Stouffville recognized the Mantle site as "one of the most significant Huron ancestral villages in Southern Ontario," and committed itself to work with the Huron to "assign aboriginal names to watercourses, streets and trails in and around the Mantle site and elsewhere in the municipality." In 2011, the York Region District School Board announced that it would name the new school to be built adjacent to the site the "Wendat Village Public School." In Summer 2011, Wendat ceremonies were held at the site and it was renamed the "Jean-Baptiste Lainé" Site. The Huron (Wendat) are considered part of the larger Iroquoian cultural and language family. 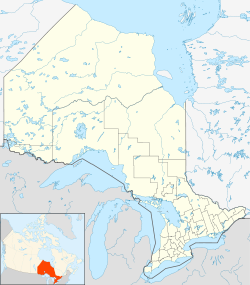 The Huron-Wendat Nation is a First Nation whose community and reserve today is located at Wendake, Quebec. The Huron, as well as other local First Nation peoples, have urged towns and developers in York Region to preserve indigenous sites "for worship at the places where [their] ancestors are buried." The discovery of a sixteenth-century European axe at Mantle is also of political importance for the Wendat First Nation for current negotiations with federal and provincial governments. In 2012, a two-hour documentary film on the Mantle Wendat-Huron Village Site, Curse of the Axe, was produced by yap films in association with Shaw Media, and narrated by Robbie Robertson. Archaeological Services, Inc. "The Archaeology of the Mantle Site (AlGt-334): Report on the Stage 3–4 Mitigative Excavation of Part of Lot 22, Concession 9, Town of Whitchurch-Stouffville, Regional Municipality of York, Ontario." December, 2012. Bicknell, Robin (director, producer, writer). Curse of the Axe (2012). Documentary film produced by yap films in association with Shaw Media (128 min; search YouTube). Birch, Jennifer. Coalescent Communities Iroquoian Ontario. PhD Dissertation, Dept. of Anthropology, McMaster University, 2010. Birch, Jennifer. "Rethinking the Archeological Application of Iroquoian Kinship." Canadian Journal of Archeology 32 (2008): 194–213, esp. p. 205. Birch, Jennifer. "Coalescence and Conflict in Iroquoian Ontario." Archeological Review from Cambridge 25, no. 1 (2010): 29–48. Birch, Jennifer, and Ronald F. Williamson. The Mantle Site: An Archaeological History of an Ancestral Wendat Community. Lanham, MD: AltaMira Press, 2013. Ramsden, Peter. "Book Review: The Mantle Site: An Archaeological History of an Ancestral Wendat Community," Ontario Archaeology 93 (2013): 219-223. Sioui, Georges E. Wendat: The Heritage of the Circle. Trans. J. Brierley. Vancouver, BC: UBC Press, 1999. Trigger, Bruce. The Children of Aataentsic: A History of the Huron People to 1660. 2 vols. Montreal: McGill-Queen's Univ. Press, 1982; also "Sixteenth Century Ontario," in Natives and Newcomers: Canada's "Heroic Age" Reconsidered. Montreal: McGill-Queen's Univ. Press, 1986. Pp. 149–161. Warrick, Gary A. A Population History of the Huron-Petun, A.D. 500-1650. New York: Cambridge University Press, 2008. Williamson, Ronald F. "What will be has always been: The past and presence of northern Iroquoians." In The Oxford Handbook of North American Archaeology, ed. T.R. Pauketat. New York: Oxford Univ. Press, 2012. Ch. 23, pp. 273–284, esp. pp. 277-281. Williamson, Ronald F., ed. Toronto: An Illustrated History of its First 12,000 Years. Toronto: James Lorimer, 2008. Ch. 2 (with some photographs of the Mantle Site project, pp. 37, 40, 45, 47). Williamson, Ronald F. "The Archaeological History of the Wendat to A.D. 1651: An Overview." Ontario Archaeology 94 (2014): 3-64. Jarus, Owen. The Mantle Site: Photos of Ancient City. Live Science, July 9, 2012. ^ Toronto Museum Project, Dunsmere Pipe Archived 2011-07-06 at the Wayback Machine. An exhaustive archaeological study of the Mantle Site is provided by Jennifer Birch, "Coalescent Communities in Iroquoian Ontario," unpublished PhD Thesis, McMaster University, Hamilton, 2010. ^ Compare Archaeological Services Inc.'s "The Mantle Site Plan" with Google satellite view; compare also the 1878 map of the Township of Markham, Illustrated historical atlas of the county of York and the township of West Gwillimbury & town of Bradford in the county of Simcoe, Ont (Toronto: Miles & Co., 1878); the house "foundation" and "disturbed area" on the Mantle Site Map are the farmstead and mill of Sam. Byer, Lot 33, Concession 9; see also Google street view. The archaeological community was already aware of First Nations artifacts on Lot 33, Concession 9; in A.F. 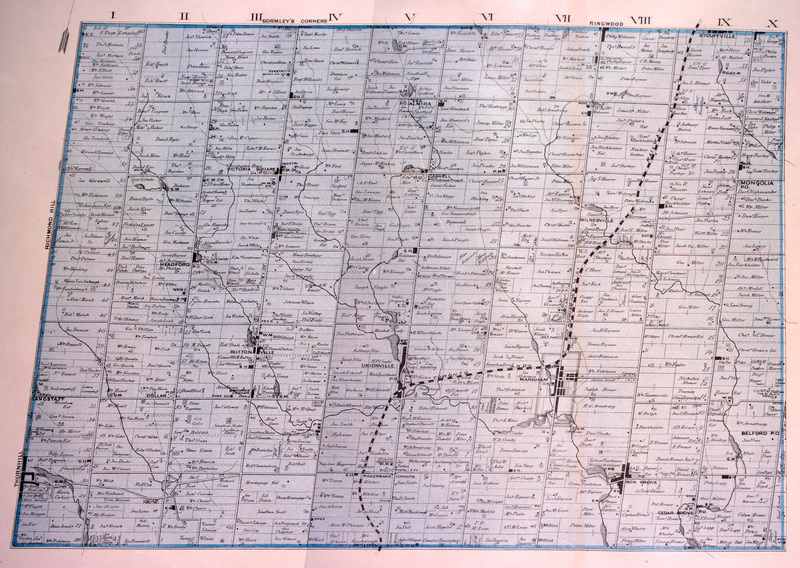 Hunter, List of York County Sites (1910; available at Museum of Civilization), A.J. Clark writes: "Markham Twp. York Co. Village Site Lot 33 Con. 9 ... Site is south of the village of Stouffville. Wilmot Brown of Stouffville (Sept. 15-1906) is authority for statement that his father remembered an Embankment all around this site which enclosed about three (3) acres. Pottery, arrowheads and pipe of 'belt' pattern." Clark was working on the site around 1925. ^ Keith Bolender, "Million pieces turned up Archived 2011-07-06 at the Wayback Machine," Stouffville Tribune, August 24, 1978; also Draper, Encyclopedia of Prehistory, vol. 3 (Springer, 2002), p. 352. The specific location of the Draper Site is on parts of lots 29 and 30, Concession VIII, Pickering Township; see V.A. Konrad, W.A. Ross, and I. Bowman, North Pickering Archaeology (June 1974), 78. An interim period may have been spent on the Spang site in Pickering; cf. Jacqueline Carter, Spang: A Sixteenth Century Huron Village Site, Pickering, Ontario, Department of Anthropology, University of Toronto, 1981. ^ See documentary film, "Curse of the Axe (History Television.ca), 128 min. See also Patrick Cain, "Vanished Huron village in Whitchurch-Stouffville held baffling mystery," Global News, July 6, 2012; "Ancient axe found could rewrite Canada's history," Global News, July 10, 2012; Mary Ormsby, "How did Huron-Wendat get 'cursed' European axe a century before European contact?," Toronto Star, July 7, 2012; Owen Jarus, "An 'Indiana Jones' moment: Cosmopolitan village dug up. Big, complex 'New York City' of 500 years ago uncovered by archaeologists in Canada," MSNBC, July 10, 2012. ^ "Curse of the Axe on History," Northernstars.ca, the Canadian Movie Database, July 6, 2012; Mike Finnerty, "Interview: The Curse of the Axe, with R.F. Williamson and L. Lainé" (audio), CBC The Current, July 9, 2012 (23:59 minutes); cf. also Wilhelm Murg, "How did a Spanish Axe wind up in Toronto 100 years before Europeans?," Indian Country: Today Media.com (July 9, 2012). ^ Archaeological Services Inc., "The Mantle Site". See also artist's reconstruction of long-house interior; R.F. Williamson and A. Clish, "The Mantle Site: Urban Planning in Sixteenth Century Ontario," presented at the Canadian Archaeological Association, Toronto, 2006. ^ Toronto Museum Project, Dunsmere Pipe Archived 2011-07-06 at the Wayback Machine; also R.F. Williamson, "What will be has always been: The past and presence of northern Iroquoians," in The Oxford Handbook of North American Archaeology, ed. T.R. Pauketat (New York: Oxford Univ. Press, 2012), p. 281. ^ Mike Finnerty, "Interview: The Curse of the Axe, with R.F Williamson and L. Lainé" (audio), CBC The Current, July 9, 2012 (23:59 minutes). ^ R. Williamson, cited in Owen Jarus, "An 'Indiana Jones' moment: Cosmopolitan village dug up. Big, complex 'New York City' of 500 years ago uncovered by archaeologists in Canada," MSNBC, July 10, 2012; also R. Williamson, "From Mastodons to Mantle: Preserving the Aboriginal Past of York Region," public lecture, Stouffville, ON, Feb. 25, 2011, where Williamson notes up to 6,800 hides per year. ^ Williamson and Clish, The Mantle Site: Urban Planning in Sixteenth Century Ontario; for images, see the Toronto Museum Project, Dunsmere Pipe Archived 2011-07-06 at the Wayback Machine, and Archaeological Services Inc., "The Mantle Site." ^ R.F. Williamson, "What will be has always been: The past and presence of northern Iroquoians," in The Oxford Handbook of North American Archaeology, ed. T.R. Pauketat (New York: Oxford Univ. Press, 2012), p. 281. ^ Hannelore Volpe (with reference to Dr. R.F. Williamson), Stouffville's Archeological Treasure Archived 2011-07-06 at the Wayback Machine, Stouffville Sun-Tribune, March 29, 2007, p. 14. ^ R.F. Williamson in interview with Mike Finnerty, "Interview: 'The Curse of the Axe,'" (audio), CBC The Current, July 9, 2012 (23:59 minutes). ^ See List of archaeological sites in Whitchurch–Stouffville. ^ Archaeological Services Inc., "The Mantle Site Archived 2012-03-10 at the Wayback Machine"; see also the following illustrations: "Late Period (AD 1400 – European Contact)," and "Late Period Village", Historical Atlas of Canada, vol. 1 (Toronto: University of Toronto Press, 1987), plates 11 and 12. ^ Lead archeologist, Dr. Ronald F. Williamson, noted that the excavation was one of "the most nationally significant of the hundreds he has excavated in Ontario" (Canadian War Museum, "Thousands of Southern Ontario artifacts to be safeguarded by the museum," Kudos! [Spring 2011]). ^ Canadian Museum of Civilization Newsletter, "Digging up the Past," June 2011. ^ Archaeological Services Inc., Mantle Site Archived 2012-03-10 at the Wayback Machine; Toronto Museum Project, Dunsmere Pipe Archived 2011-07-06 at the Wayback Machine; Gail Swainson, "U of T Basements Hold Thousands of Remains", Toronto Star, September 3, 2010. ^ See "Did you know: Mantle Site (interview with Dr. Jennifer Birch," Rogers TV Videos First Local (2:14 minutes; accessed July 18, 2012); Ministry of Municipal Affairs and Housing, Communicating with Aboriginal Peoples: The Municipal Role (Presentation, London, ON, 2007); compare Slide 5 (aerial photograph identifying the Mantle Site, looking south) with Google satellite view and location of storm water pond. "In York Region, such a fate for an Iroquoian village is common. Builders here accept salvage archeology as a normal part of the development process, but still opt to remove sites rather than build around them. 'It's an economic decision.'" Development leaving history in a box, by M. Adler, Stouffville Sun-Tribune, August 23, 2003, p. 3. The Toronto Star quotes David Donnelly, lawyer for the Huron-Wendat Nation, on new provincial guidelines for consultation expected January 1, 2011: "The developers will invite the First Nations in for a chat and then, nine times out of ten, development will just go ahead" First Nation Battles for History in Court, Sept. 10, 2010. In the area immediately north of the village site the creek had been damned by early European pioneers (Boyer's (Byer's) Pond), which in turn powered Boyer's Mill (edge the Mantle village site); cf. Jean Barkey et al., Stouffville 1877–1977 (Stouffville, 1977), pp. 122, 127. ^ Ron Williamson and Chief Kris Nahrgang, First Nations History in Southern Ontario – South East Region, presentation, slide 10. ^ See comments by owners, Community Forums, Fieldgate River Ridge, June 2006, pp. 20ff. ^ In ancient Wendat tradition, the dead would be initially buried in a temporary grave, and every ten years the bones would be moved to a mass grave in an elaborate ceremony; cf. R.F. Williamson, cited in R. Green, Talks on Over Bones, Stouffville Sun-Tribune, August 13, 2005, p. 7; see depiction of ancestral Huron Feast of the Dead in which remains reburied in large communal pit (ossuary) in J.-F. Lafitau, Moeurs des sauvages amériquains, comparées aux moeurs des premiers temps, vol. 2, 1724, p. 456. ^ Town of Whitchurch-Stouffville, Council Public Hearing Agenda, March 23, 2010, Item 4.1 (with attachments) – Lot 32, Concession 9. ^ R.F. Williamson, cited in J. Ransberry, Native Village discovered at Housing Development, Stouffville Sun-Tribune, July 17, 2004, p. 12; also in Ransberry, Huron Village Artifacts may Stay in Stouffville, Stouffville Sun-Tribune, June 9, 2005, pp. 1, 11. See also R. Williamson, cited in H. Volpe, Stouffville's Archeological Treasure Archived 2011-07-06 at the Wayback Machine, Stouffville Sun-Tribune, March 29, 2007, p. 14. ^ Ipperwash Commission of Inquiry, Final Report, Aboriginal Burial and Heritage Sites, Ipperwash Inquiry vol. 2 (2007), ch. 6, esp. p. 134, 148. These recommendations continue to be ignored: for example, in 2010 the Huron-Wendat nation was not consulted about an excavation in Vaughan so as not to hold up development; cf., Gail Swainson, Toronto Star, First Nations want say in the preservation of important archaeological sites in Ontario, Aug. 29, 2010; U of T basements hold thousands of remains, Sept. 3, 2010; "First Nation battles for history in court", The Star, Sept. 10, 2010. ^ Town of Whitchurch-Stouffville, "Huron Ancestral Village Resolution (C10-C0 & R00)," June 17, 2007 (renewed commitment by a new council of Feb. 17, 2015: Minutes, "Historic Plaque for the Mantle Site(R01);" see also comments by Councillor Susanne Hilton, in H. Volpe, "Stouffville's Archeological Treasure," Stouffville Sun-Tribune, March 29, 2007, p. 14. On February 24, 2011, Councillor Hilton announced publicly that the Huron have been consulted, and an interpretive trail carrying a Huron name will be created. No heritage designation for the site has yet been adopted. The Stage Four Salvage Excavation of the Mantle Site report by Archeological Services, Inc. for the Ministry of Culture and the Town of Whitchurch–Stouffville has not been released publicly. Though Huron elders performed ceremonies on the site in 2004, the street names chosen for the area (Town of Whitchurch Stouffville, "Council in Committee Agenda," April 20, 2004) are not First Nation names. In 2009 the Whitchurch-Stouffville Museum in Vandorf began a Discover First Nations program. ^ Town of Whitchurch-Stouffville, "Council in Committee Report," July 19, 2011. ^ Jim Mason, "Stouffville history hits home in TV documentary," Stouffville Sun-Tribune, July 11, 2012. ^ Huron-Wendat Nation, Wendake, Quebec. ^ See Mike Adler, "Natives Urge Protection of Aboriginal Sites," Stouffville Sun-Tribune, September 7, 2002, p. 3. ^ Cf. Luc Lainé, cited in Wilhelm Murg, "How did a Spanish Axe wind up in Toronto 100 years before Europeans?," Indian Country: Today Media.com (July 9, 2012). ^ Mike Finnerty, "Interview: The Curse of the Axe, with R.F. Williamson and L. Lainé" (audio), CBC The Current, July 9, 2012 (23:59 minutes).